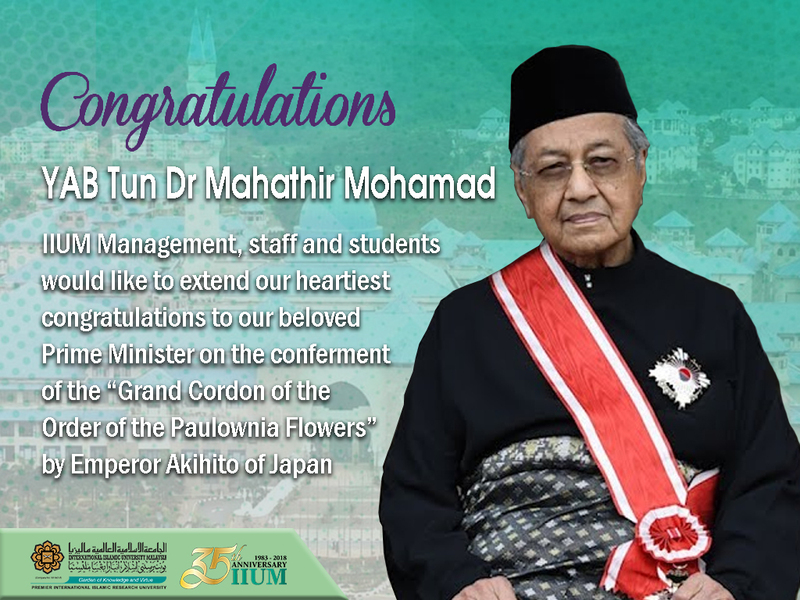 IIUM Management, staff and students would like to extend our heartiest congratulations to our beloved Prime Minister YAB Tun Dr Mahathir Mohamad on the conferment of the “Grand Cordon of the Order of the Paulownia Flowers” by Emperor Akihito of Japan on Tuesday 6 November 2018 at the Imperial Palace, Japan. The order is the highest award that can be conferred upon foreign statesmen for their contribution towards the bilateral relations between their respective countries and Japan, as well as their contribution to the region. YAB Tun Dr Mahathir is the third leader from Asia to be presented with the prestigious award after the former Prime Minister of Singapore, the late Mr. Lee Kuan Yew and former Indian Prime Minister, Mr. Manmohan Singh.